Students of St. Martin of Tours School in Northeast Philadelphia enjoy the annual fundraising gala for the school April 14. 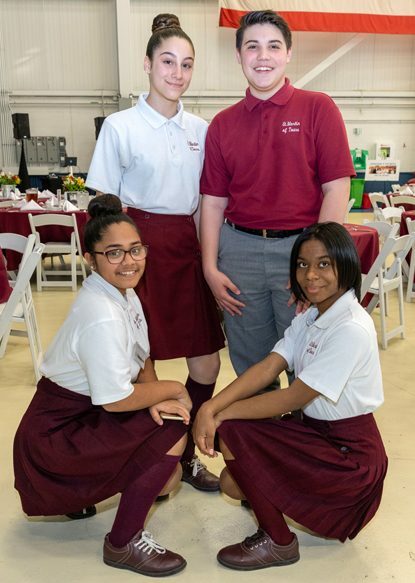 St. Martin of Tours School, an Independence Mission School in Northeast Philadelphia, held its annual gala April 14 at Leonardo’s Helicopter Hangar in Philadelphia. Among the honorees at the fundraiser were Wendell Young IV, president of UFCW Local 1776, Christian Brother Richard Kestler, an alumnus of St. Martin of Tours School and Mary Harkins, principal of Archbishop Wood High School. State Sen. Christine Tartaglione, an alum of St. Martin’s, was also present to congratulate the honorees for years of service to their communities. Since becoming an Independence Mission School in 2013, St. Martin’s has raised over $500,000 to offset tuition costs to families who send their children to the school. Since the gala’s inception three years ago, it has raised $200,000. As a result, enrollment has increased to over 500 students from all religious backgrounds and cultures. St. Martin School is not only a place to learn, but is also a place to find faith in Christ and hope for the children’s future.